Each Spring, just before Ocean City, MD is flooded with hundreds of thousands of tourists, thousands of classic cars, Hot Rods, and tricked out trucks flood the streets for the annual Cruisin’ Ocean City Car Show, held in late May. Cruisin’ Ocean City attracts car owners and enthusiasts from all over the East Coast and originates from the Inlet Parking Lot and Convention Center. Cruisin’ Ocean City is a weekend of piston-pumping action that includes over 3000 unique rides, a multitude of car shows all around town, national vendors offering the latest products and services, live music by big-name musicians, and lots of burnt rubber. The most popular of the car shows are the daily Boardwalk parades that will take place at 8 a.m. on Thursday, Friday, and Saturday each year at Cruisin’ Ocean City. The procession begins at North Division Street and cars parade to the Inlet Parking Lot where the day’s activities commence. Don’t just sit on the sideline this year, register (and show off) your car in the Boardwalk parades! 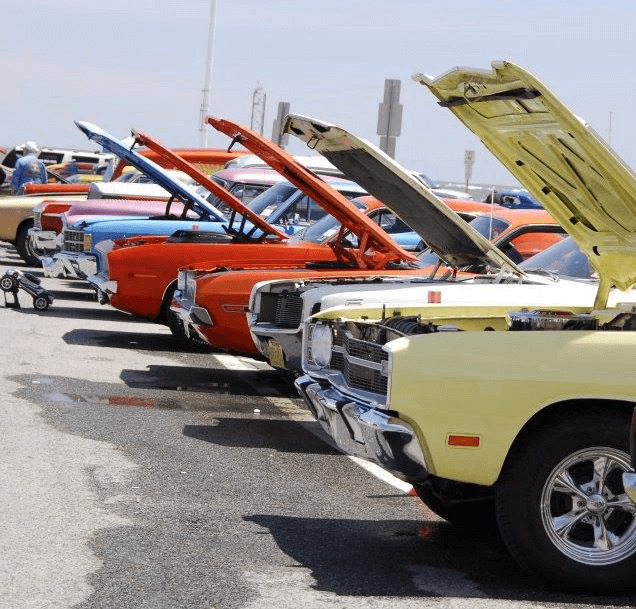 Regardless whether you’re entering your car for one of the hundreds of prizes on the line in the Boardwalk parades and other car shows, or just really love the soothing sound of dual exhaust, Cruisin’ Ocean City is a weekend you absolutely can’t miss. The town of Ocean City has a trailer parking ordinance which prohibits trailer parking on city streets from May 1st – October 31st. Any Cruisin participants that will be parking a trailer on city streets will need a trailer parking permit. Trailer parking permits are $50 and can be purchased at the event or in advance by mailing in a permit application. Only registered Cruisin participants may purchase a trailer permit. Free trailer parking is available at the route 50 Park & Ride. When making your reservations please check with your hotel or condor to see if they provide trailer parking. For a trailer parking permit application please click here. Cruise on down to Ocean City, MD for one of the largest car shows on the east coast! Enjoy four days of hot rods, trick trucks, custom and classic cars. Cruisin’ weekends are popular both in the spring and in the fall because it gives car enthusiasts a chance to show off and, in a way, have the beach weekend to themselves. To that end, hotels have Cruisin rates and restaurants run specials all weekend as a way to welcome the cruisers and cruiser enthusiasts. It’s also a great opportunity to explore the area as cruisers also have events throughout the region, including special events in Berlin, Md. during which the town and the shops also hold special cruiser themed events. To stay up to date on everything Ocean City be sure and subscribe to our email list and get Ocean City in your inbox every week.